Pizzato Elettrica has introduced the EROUND self-monitored contact block, with the same overall dimensions of an ordinary contact. This contact block is particularly recommended for emergency push-buttons and for all those devices in which it is found useful to detect any malfunction caused by contact incorrectly fixed by the operator, fixing adapter incorrectly locked by the operator, or operator's neglect in carrying out installation operations. Therefore, with the opening of the electrical circuit, the self-monitored contact block automatically detects the following situations: contact block detached from the respective fixing adapter, and fixing adapter detached from the activating device. 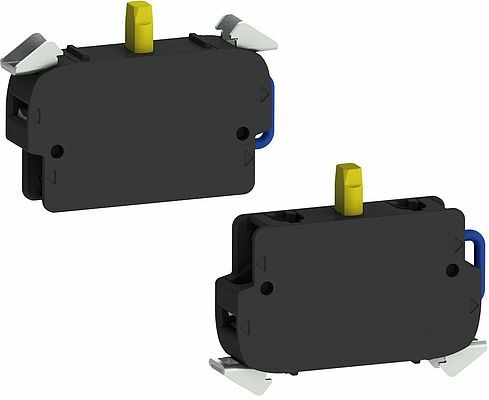 Provided with 1 NC contact with positive opening, the self-monitored contact block is available both in panel-mounted and box-mounted versions.